Macrosiphum cholodkovskyi apterae (see first picture below) are yellow-green to dark blue-green or coral-pink to red, often with a darker longitudinal mid-dorsal band. The antennae are rather dark except at the bases, and are longer than the body. The femora and tibiae are dark distally. The siphunculi are mainly dusky, with a dark tip and a pale base, and are 1.7-2.2 times the length of the rather thick and blunt cauda. 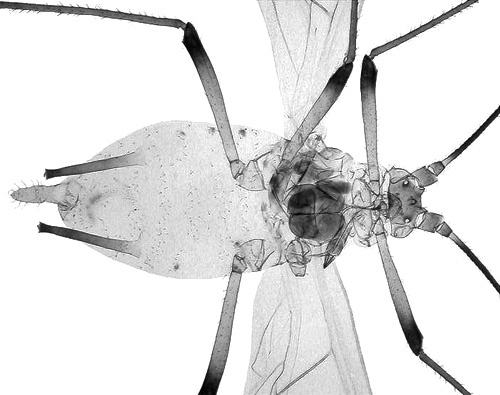 The body length of adult Macrosiphum cholodkovskyi apterae is 3.1-5.1 mm. 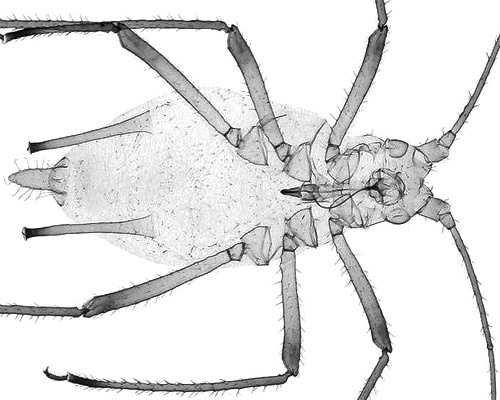 The alate Macrosiphum cholodkovskyi (not pictured) has a brown head and thorax with the abdomen with rather pale marginal sclerites. The immatures (see second picture above) usually have a a darker longitudinal mid-dorsal band. The clarified slide mounts below are of adult viviparous female Macrosiphum cholodkovskyi : wingless, and winged. 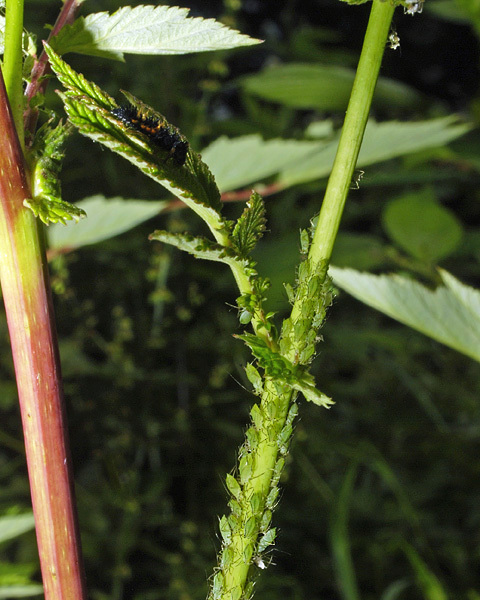 The meadow sweet aphid does not host alternate but spends its entire life cycle on meadowsweet (Filipendula ulmaria), and occasionally on valerians (Valeriana alliariifolia). Macrosiphum cholodkovskyi lives on the stem and among the flowers. It is found throughout Europe and parts of Asia. The meadowsweet aphid is a rather common aphid in southern England, and in late late spring and early summer we have usually found it wherever its host, meadowsweet, is growing. 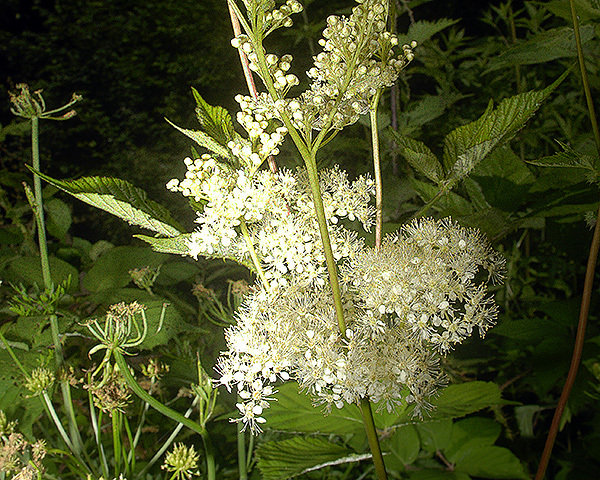 The host plant, Filipendula ulmaria (see picture below) is quite distinctive with large pinnate leaves and delicate creamy white flowers clustered in irregularly branched cymes. 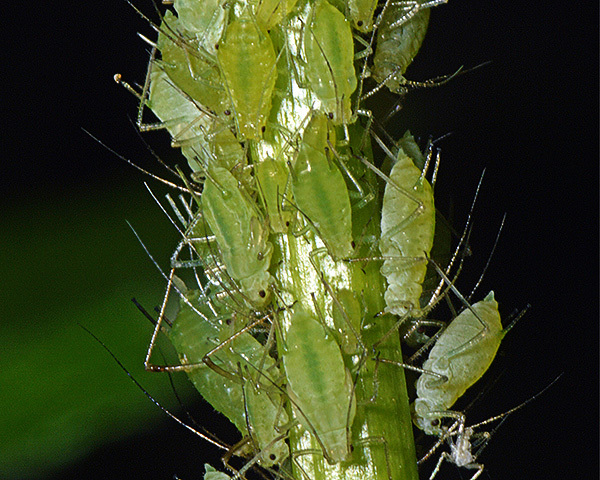 Many of the plants may host large colonies of Macrosiphum cholodkovskyi, initially on the stem (see picture below), and later in amongst the flower heads. Colonies attract large numbers of predators, and a larval coccinellid can be seen resting on a leaf in the picture above. One of the more notable things about Macrosiphum cholodkovskyi is its size. 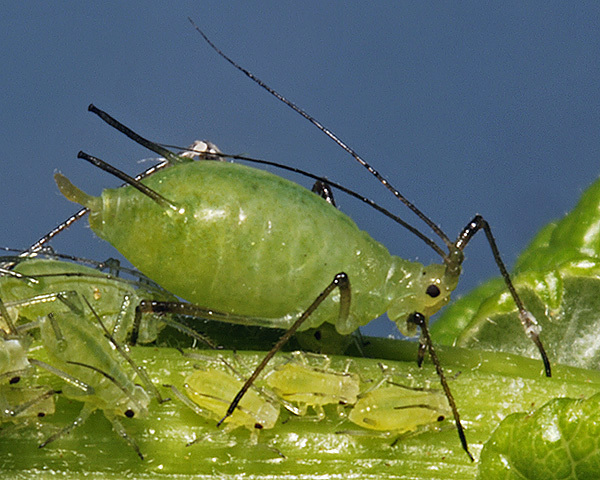 It is one of the larger species of aphids amongst the Macrosiphini with an adult body length of 3.1-5.1 mm. Sexual forms develop in autumn. The oviparae are pink or greenish yellow and the alate males are dirty reddish or brownish green. Macrosiphum cholodkovskyi has been recorded from 4 Filipendula species (Filipendula rubra, Filipendula ulmaria, Filipendula vestita, Filipendula vulgaris). Blackman & Eastop list 10 species of aphid as feeding on meadowsweet (Filipendula ulmaria) worldwide, and provide formal identification keys. 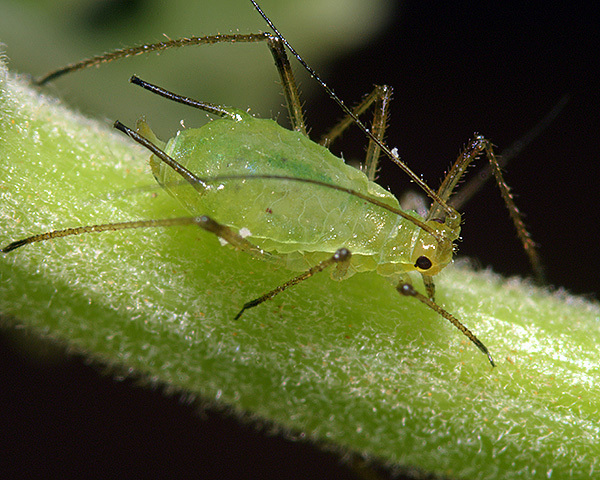 Of those aphid species, Baker (2015) lists 7 as occurring in Britain: Amphorophora gei, Aphis craccivora, Aphis fabae, Aphis gossypii, Aphis ulmariae, Aulacorthum solani and Macrosiphum cholodkovskyi. Macrosiphum cholodkovskyi has been recorded from 1 Valeriana species (Valeriana alliariifolia). 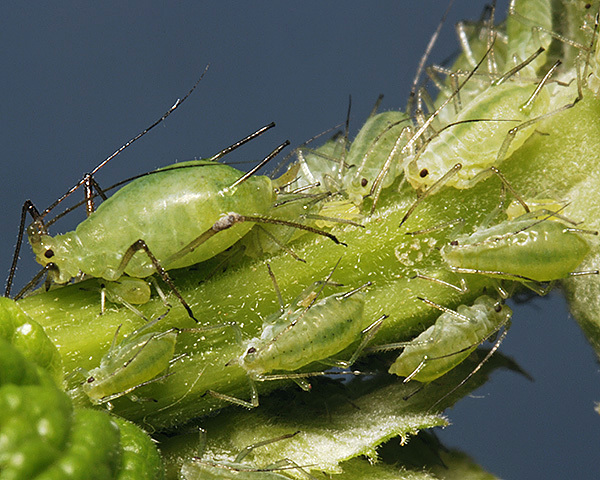 Blackman & Eastop list 3 species of aphid as feeding on Sirene valerian (Valeriana alliariifolia) worldwide, and provide formal identification keys. Of those aphid species, Baker (2015) lists all 3 as occurring in Britain: Aphis fabae, Macrosiphum centranthi and Macrosiphum cholodkovskyi.